SANDAG map shows portion of I-5 to be closed and detour on I-805. 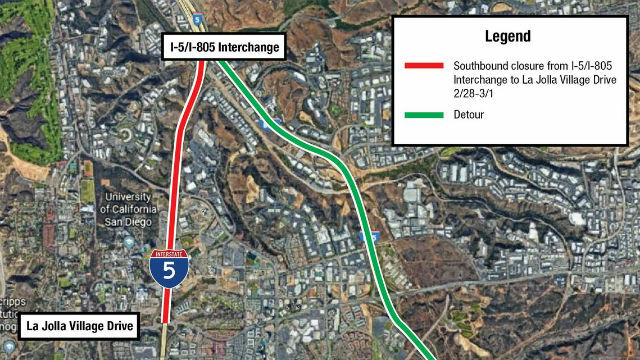 All southbound lanes of Interstate 5 will be closed in University City from 9:30 p.m. Thursday evening to 5 a.m. Friday morning for trolley work, according to the San Diego Association of Governments. SANDAG construction crews plan to continue construction on a new trolley overpass over I-5 at Voigt Drive during the closure. According to the agency, work crews plan to pour concrete to form the bridge that will support the trolley tracks. I-5 southbound will be closed from the I-5 and Interstate 805 interchange to La Jolla Village Drive and significant delays are expected.